Last time it was Xirrus Wi-Fi Inspector and Chocobito had recommended in comments another wireless scanner app – inSSIDer. 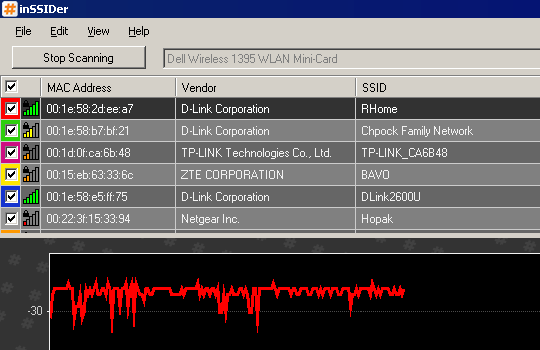 As most of such utilities inSSIDer scans for wireless access points and displays connection and signal data for them. Much like Xirrus it packs everything in single screen, but allows to toggle display of parts. This one found twice more APs than any other tool I had tried. It doesn’t limit itself to several strongest signals as usual but will also picks up and logs farthest and weakest. Visualization graphs are excellent. Not much interesting about raw signal strength, but second graph makes good explanation of relative signal strengths of networks and channels they occupy. Although I had no opportunity to try that, app supports GPS and export to Google Earth for creating real maps of access points. Not critical, but I like a lot locator feature of Xirrus that makes easy to find areas with stronger signal by listening to clicks and without looking at screen. 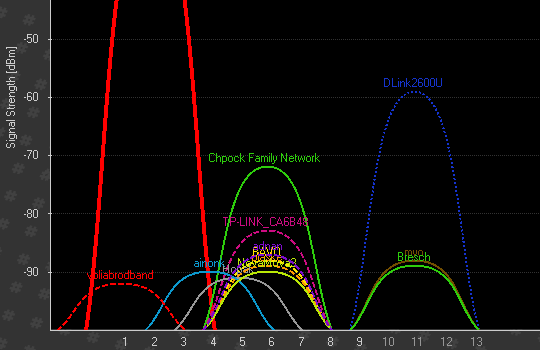 inSSIDer has no audio features and real distance to access points can only be derived from signal strength. Most impressive app that is excellent at picking up weak signals. Open source, but requires .NET Framework so is not portable. And as it seems traditional for network apps site also has page on additional wireless tools. well, I tried to install this using Sandboxie (http://www.sandboxie.com/) – it worked. Using this workaround you could say it’s portable as I was able to copy the program after installation with sandboxie to a different folder. Well, many non-portables can be converted to such with help of additional tools and virtualization. In my posts I stick to native app’s capabilities and more harsh portable definition. Not being portable is hardly a flaw, but being truly and natively portable is great plus for software.